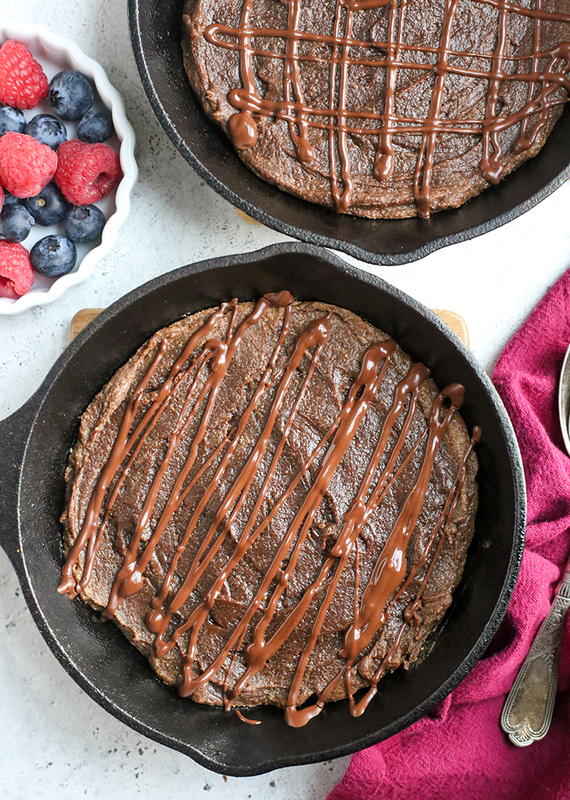 This Paleo Nut Free Skillet Brownie For Two is such a great quick dessert perfectly portioned for 2 people. Rich, sweet, and healthy! They are gluten free, dairy free, and naturally sweetened. 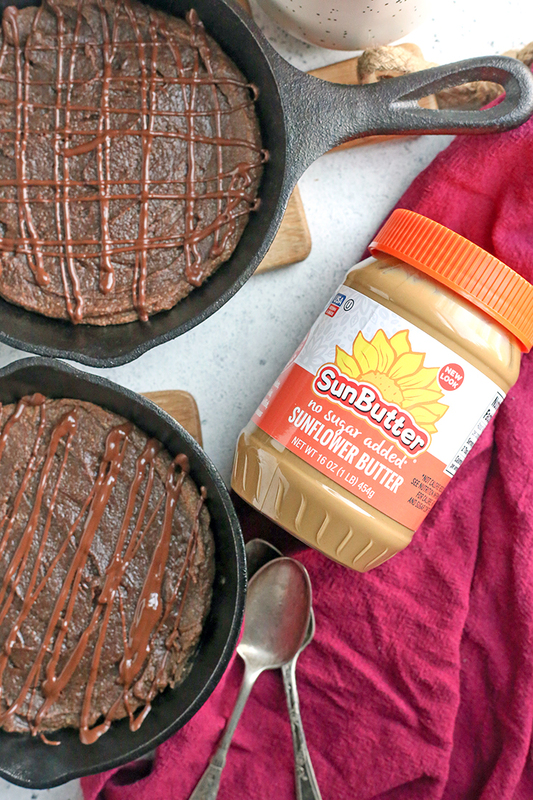 This post is sponsored on behalf of SunButter. All opinions are 100% my own, of course! Thank you for supporting brands that help make Real Food with Jessica possible! I am here sharing maybe my first official Valentine’s Day recipe. We don’t really celebrate it so it’s not a big deal for us, but I thought it would be fun to make a dessert for two. 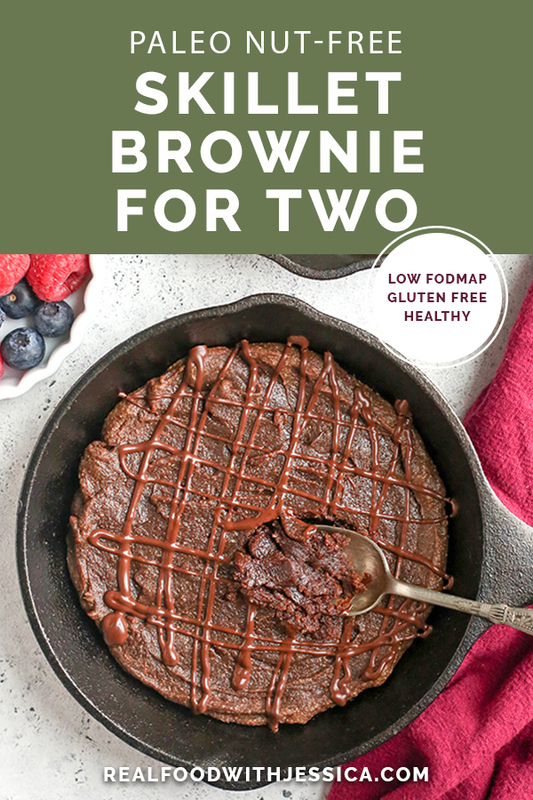 I think doing a home cooked meal and dessert is a great idea and these brownies are so quick and delicious. 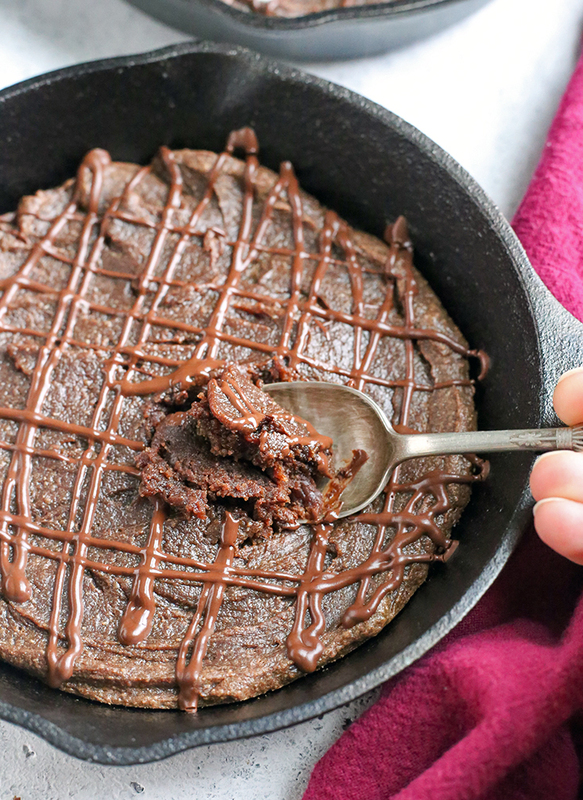 These brownies are nut free thanks to No Sugar Added SunButter, which is my favorite. That’s the base and then a little coconut flour is used for texture. The SunButter adds great richness and helps keep them moist. These actually took a few tries to get perfect. Sometimes I nail it on the first try, and other times it takes multiple tries. 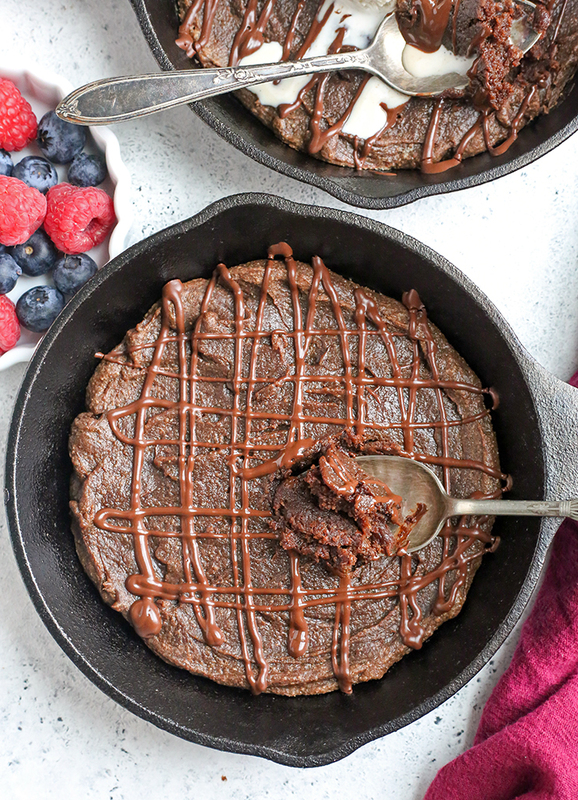 I finally figured out the right amount of ingredients and the best baking time to create that rich, soft, sweet brownie and is gooey in the center and doesn’t taste healthy! 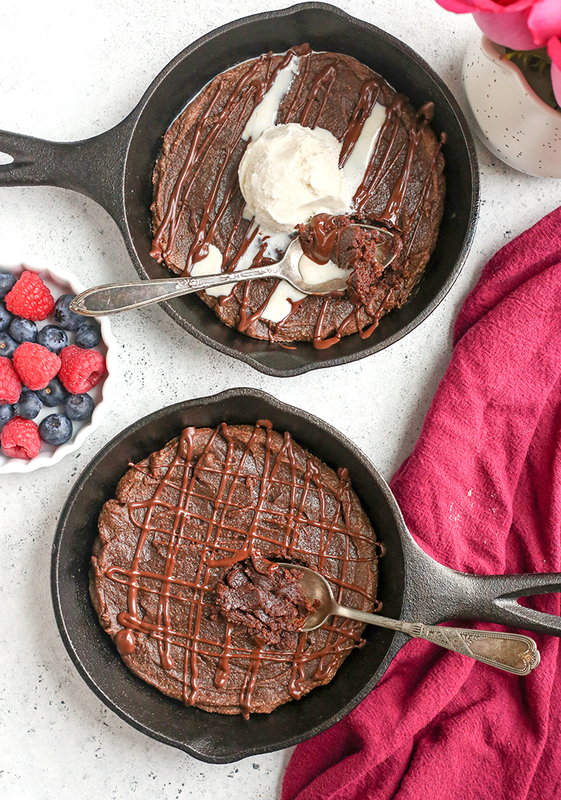 I don’t ever want to share a recipe that is just okay, I want to love it, and I love these brownies! These are the cute little cast iron pans I used that are super affordable. I actually thought they would be a pain to cook and clean, but the brownies didn’t stick at all and they cleaned right up. I definitely need to make more desserts in them knowing that! The ingredients are so simple and you probably have them on hand already. They mix up quick and bake for only 10 minutes. Really, in about 15 minutes total, you have a chocolatey dessert. So easy! This is also my first low FODMAP dessert recipe. I mainly stick to dinners and sides, but it was fun making this so we could actually enjoy it. Maple syrup is a low FODMAP sweetener, coconut flour is okay in small amounts (like this) and No Sugar Added SunButter is low FODMAP as well. I hope you try these, even if it’s not for Valentine’s Day. Maybe you and your best friend want a treat, or you and your son or daughter. They really are a great dessert for any reason. 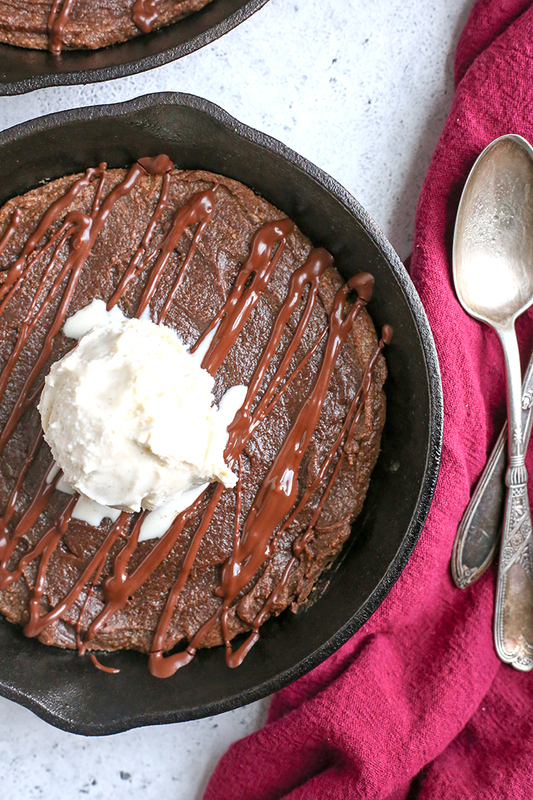 You can top it with some Paleo Vanilla Bean Ice Cream if you want. HERE are the cast iron pans I use. They are so cute and affordable. I think a 5 inch pan would also work if you have it. Preheat oven to 350° and grease two 6.5 inch cast iron skillets with coconut oil. In a medium bowl, combine SunButter, maple syrup, salt, vanilla and egg. Stir well. Add in cacao powder and coconut flour and stir to combine. Divide the mixture evenly between to two pans and spread out evenly. Bake for 10 minutes. Be careful if serving right away as the pans will be hot. *If you don't want to use the pans, this recipe can be doubled and baked in a 8x8 pan for about 25 minutes.